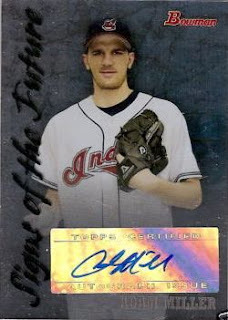 Indians Baseball Cards: Do the numbers add up? The Indians sure hope the numbers add up for Adam Miller. He had four starts in the minors last year and amassed a 6.48 ERA. In my book, not a good number. He went with a 1-1 record and his 17 hits and 12 earned runs allowed in 16.2 innings brought him that nasty ERA. So, how do these numbers add up to Miller being the LEADING relief pitching prospect for 2009? The Tribe is banking on his fastball. It has been consistently clocking in at 97 mph, according to reports. He's also undergone finger surgery this past season for an injury he had in '07. That does not add up to a promising career in the bigs to me. Maybe I'm a little jaded here, but can a 97 erase the 6.48, 17, 12, and 16.2? Given the Indians current financial situation and roster, I don't think we've got much choice but to hope it can. We could certain use some "angels on the ballfield" if we expect to do better in 2009.